"Britain still lags behind neighbouring countries; only 10 per cent of the UK's new homes are self-builds, compared with around 50 per cent in other European countries." This week, Labour's Shadow Housing Minister suggested that more people should be encouraged to build their own homes. It comes as part of the party's plan to tackle the housing 'crisis' in Britain, which both the government and the opposition have alluded to in recent years. 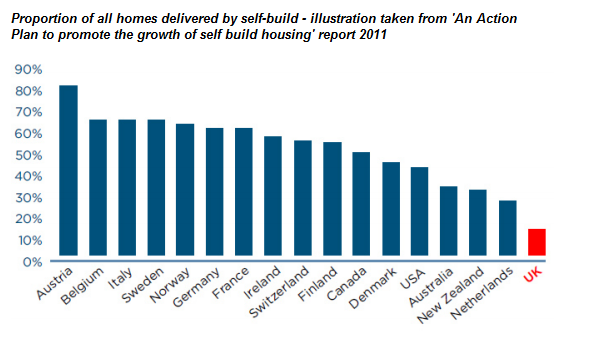 The UK's self-builders are a rare breed, says the Independent this week; compared to other countries, we're lagging well behind. The figures do suggest this, but they're out-of-date. Self-building isn't measured directly and estimating it is an inexact science. That's what researchers from the University of Sheffield and elsewhere call the oft-used visualisation which summarises the issue. The government have used this in their own Housing Strategy for England. But the data behind this graph comes from a 1992 study from the University of Sussex, which we haven't been able to find online. It's an analysis of figures from various countries' national statistics institutes. It's not possible to be any more detailed about the methodology behind these figures, but the age of the figures is a big problem either way. That said, there are more recent clues to help fill in some of the gaps. That's according to Homebuilding and Renovating Market Research's latest report. There's no official measure of how many homes are self-built, but people who do build their own homes can reclaim VAT on the building materials, and these figures via HMRC form the basis of estimates. That causes a problem: not everyone claims a VAT refund, so the estimates are adjusted upwards according to survey data on how many people actually do (64% reclaim VAT according to a magazine survey). The estimate that 7-8% of UK homes are self-built that this method gives us might be the best figure we have, but it is still likely to be subject to a wide margin of error. It's similar to the 1992 findings, but the figure is still not a fact. The most recent data that's cited for international comparisons is a Dutch study from 2010, which has figures for different countries up to 2009. There are no UK figures, but self-building as a proportion of new homes is put at almost 50% in Hungary and Slovakia for the most recent year. But the definition varies from country to country: in some cases only single homes are measured as opposed to larger group developments. For other countries, the data is simply missing. The general picture still suggests the UK's figure of around 7-8% is low by international standards. A survey by the University of York last year asked self-builders about the main barriers to development, with finding suitable land and getting planning permission being the most common complaints, and to a lesser extent finding a mortgage. Separately, researchers from the University of Sheffield have suggested that land is reportedly easier to acquire in other countries, or at the very least there is a greater 'culture' of self-provision meaning that people are more aware of the options. The Department for Communities and Local Government has acknowledged some of these factors remain a problem for the UK.